The Russian shipbuilding industry has a number of distinctive features; it is dominated by a naval focus. This tradition began under Peter the Great (early 18th century), running through the Russian Empire and Soviet Union to shape many aspects of the industry's development. For instance, in 2008, 70% of the industry's total output was naval ships, allocated both for the Russian army and exports. Thanks to cutting edge technology, Russian naval shipbuilders design and construct all types of war ships and nuclear-powered submarines. Yet this technological advancement has its downside: high production costs mean Russian civil shipbuilders lose ground to foreign competitors. Despite Russia's leadership in the military ship market, which is ready to pay a higher price for state-of-the-art vessels, its civil shipyards are lagging far behind their more cost-effective Japanese, South Korean and Chinese counterparts. This is why the Russian civil shipbuilders are trying to survive by tapping into the market of sea-river vessels and riverboats or by building custom-made high-tech sea crafts (ice-class tankers, ice-breakers, oil and gas exploration vessels, etc.). The current economic turmoil threatens to aggravate the situation in the Russian shipbuilding industry, as its commercial market is shrinking and the Russian bank credit system has almost ground to a halt. To survive, the industry will need the lifebelt of the state-financed military orders, which will mean several more years of defence orientation. Russian shipbuilders must pin their hopes on domestic and foreign demand for military products. Despite the crisis, they have good reason for optimism: many nations which benefitted from the recent economic upswing continue rearmament programmes to build up military and political status. These countries, including India, China, Vietnam and Algeria, have been major buyers of Russian naval weaponry over the last 20 years. Co-operation with India is a top priority for Russian shipbuilders. The two countries are likely to soon sign an agreement for India to earmark an extra $1.1 bn for further overhaul of the Admiral Gorshkov, a Russian-made aircraft carrier, into the INS Vikramaditya. Another important contract is the agreement for construction of the second Project 971 submarine, India's order to the Russian Amur Shipbuilding Plant. 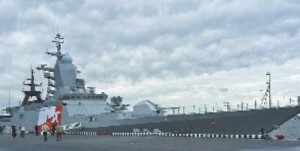 Additionally, Russia still has a chance of securing Indian contracts for construction of three new Talwar class frigates, also known as Project 11356 (three of such frigates were already built for India by the Baltiysky Zavod shipyard and three more are now under construction in the Yantar shipyard in Kaliningrad), as well as winning the tender for seven 17A frigates (with six of them built in India under a licence) commissioned by the Indian Navy. Russia's tender bid presents the Project 22350 frigate, which has been built by Severnaya Verf for the Russian Navy since 2006. Even though China prefers to build its own warships (albeit designed in co-operation with Russian engineers and partially equipped with Russian weapons), it may choose to purchase a number of "niche" units - several new-generation Project 677 (the Lada-class) non-nuclear submarines or Project 12322 Zubr air cushion landing craft - from Russia. Russia's most efficient strategy of military co-operation with India and China would be the transfer of licences and technologies to these two countries and continued supplies of weapons and equipment for their navies. In 2009, Vietnam, supported by Russia, launched licensed construction of Project 12418 Molnia missile boats with Uran-E shipborne missile systems. Besides, the Algeria and Libya markets still offer good opportunities for sale of Russia's naval armaments. As for submarine shipbuilding, Russia might soon sign its long delayed contracts with Venezuela and Indonesia, who intend to commission Project 636 diesel-electric submarines (three for Venezuela and two for Indonesia). Venezuela and other countries also plan to buy next generation Project 677 submarines in the future. Russia has also been very active in export promotion of the Stereguschiy, its brand-new stealth corvette Project 20380, which has already sparked interest in such potential buyers as Algeria, Libya and Indonesia.